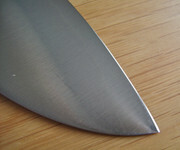 Yesterday i received two of these Kohetsu HAP40 Santoku's from Chefknivestogo.com, a dependable US dealer for kitchen knives. As often with Japanese knives the factory edges need some work to get them truly sharp, and these Kohetsu's were no exception. One was just sharp enough to slice copypaper, the other reluctantly shaved a few hairs from my hand, and both of them had a few tiny burr remnants clinging to the apex. Now both me and the new owner have zero experience with HAP40, so it will be a bit of a learning journey to finetune the edge into what works best & longest for him. For it's first sharpening i chose to just leave the factory edge angle of between 17.5 & 20 degrees inclusive (!) intact and just resharpen the existing narrow V-bevel with 3 micron diamond compound on a Paper Wheel (with such a small edge angle this actually provides for an ever so tiny, but just visible burr), and deburr with 1 micron diamond compound on a second Paper Wheel. With the naked eye it looks like nothing was done to the knife, but the new edge can whittle a chest hair towards the hair point and slice a paper towel clean. Now we have to find out if the new owner can work with it, and what's especially important; for how long exactly before it needs resharpening. My guess is that eventually he will settle upon a bit coarser edge, but we will see. 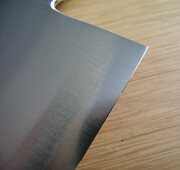 Blade: double sided convex grind with half-sided convex bevel and a narrow V-bevel on top which forms the actual edge. Last edited by kwackster on Tue Nov 06, 2018 6:30 am, edited 1 time in total. This is how i received the knife back after about a month of use in a commercial kitchen, and only after the Chef cut up several Italian artisan breads with almost rock hard crusts, which of course damaged the very hard & very thin edge. There were both chips and rolls in the apex, but only one chip extended a hair past the polished bevels (which were starting to develop a nice blueish patina). The undamaged parts of the apex however could still shave the hair on the back of my hand on skin level reasonably well. The edge was restored freehand with the help of my Tormek T7 with it's SB-250 stone, refined with a Paper Wheel coated with 3.0 micron diamond compound, and deburred with a second Paper Wheel coated with 1.0 micron diamond compound, and the new apex now measures an almost exact 20 degrees inclusive. According to the Chef this Kohetsu HAP40 is the best knife he ever owned, and from now on he will refrain from cutting those hard crusted breads with it. He also intends to buy a nice hinoki cutting board. Last edited by kwackster on Tue Nov 06, 2018 6:28 am, edited 1 time in total. The factory edge on this second Kohetsu HAP40 could just shave a few hairs on skin level, so i "resharpened" it with 3.0 micron diamond compound on a Paper Wheel, then removed the extremely fine burr with 1.0 micron diamond compound on a second Paper Wheel. On this knife i chose to also use this Wheel to blend the V-bevel into the half-sided convex to lower the cutting resistance just a tiny bit more, while keeping the new edge angle the same as that of the factory edge, namely between 17.5 and 20 degrees inclusive according to my Tormek WM200. The first picture still shows some of the deeper scratches left over from the factory edge, but these end well above the apex. You can click 2 X on each pic for a bit more detail. The knife was sold on September 17 to an avid hobby Chef in the Netherlands, and he just yesterday mailed me that he is, and i quote: "lyrical" about the knife. Recently the second Kohetsu was returned to me for sharpening. 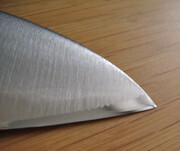 The knife had been used about 3 days a week quite intensively for 6 months, and was touched up from time to time by the owner on an MDF strop coated with 1.0 micron diamond paste. When i received the knife back i could see on the edge an area of about half an inch where it reflected a bit of light, i was told probably due to some sand particles that sometimes remain in vegetables. The rest of the edge could still easily shave clean the hair on the back of my hand on skin level.